After having introduced their new front wing at the Spanish GP, the team have already come up with an evolution of the end plates. The new endplate in fact very much resembles that as seen on their old front wing, races at the first 3 races of this year. 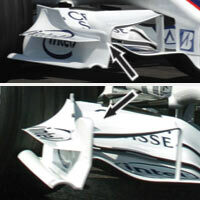 At Spain however, the endplate extended higher at the front, meaning that is also acted as the endplate of the upper front wing panel. At Monaco, the front height was reduced and the upper front wing panel being a part of it, much alike what we have seen at Renault last year before their introduced a full double front wing.